ITALY JOINS THE GLOBAL MOVEMENT FOR FOSSIL FUELS DIVESTMENT! Italian Climate Network launched the campaign #DivestItaly together with other organizations previously involved in the network Power Shift Italia. Today, the campaign is supported by 22 civil society organizations. #DivestItaly is linked with the global fossil fuel divestment movement, that calls for investors to get rid of shares, bonds and funds related to companies from the coal, oil and gas industries. As the current climate crisis needs to be urgently solved, it seems reckless to keep on investing on the very companies that are deeply responsible for global warming. In the wake of the strong message for environmental and climate justice launched by Pope Francis in the encyclical “Laudato Si’”, the campaign #DivestItaly first called for religious institutions to exclude fossil fuel companies from their investment portfolios. Later on, the campaign started addressing other types of investors – notably insurance companies – in order to ask them to change their investment policies. Want to know more? 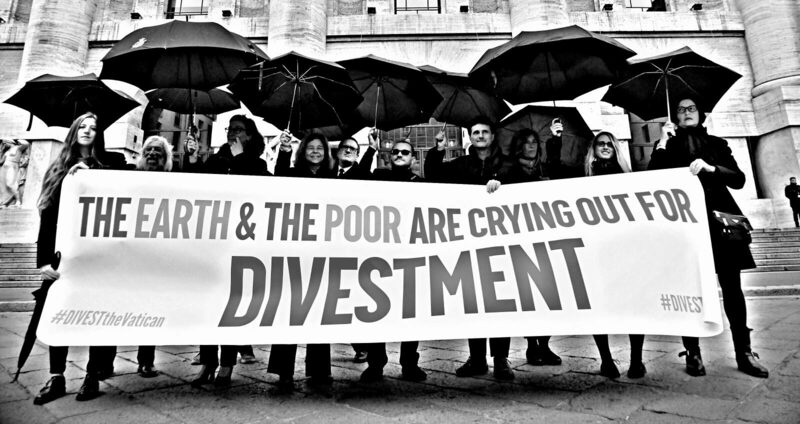 Visit the website www.divestitaly.org or drop us an email at info@divestitaly.org!